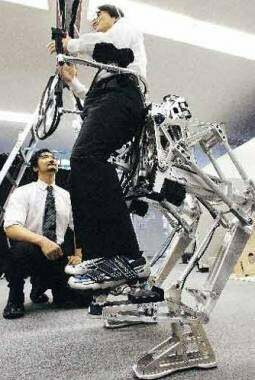 Matsushita Electric, makers of everything exoskeleton, recently annoucned their new Power Pedal robot legs. Designed for the elderly and those needing assistance, the user sits in a bicycle seat and walks somewhat normally—except with 7 times their normal leg strength. (Translation: we can all get 7 times fatter before being restricted to our beds, again). The unit's mobility is respectable, allowing 6 directions of movement while remaining functional on uneven terrain. Today, a Power Pedal will run you $127,000. But by 2015, Matsushita hopes to bring the price down to a nominal $30,000. Hmmm...car or robolegs, robolegs or car? Oh the decisions that the future will burden us with!